The northern polar region of Tethys, seen in this Cassini flyby image, is a ponderously ancient surface. Colossal impacts in the outer reaches of the solar system may have bowled over remote, frozen moons, leading to vast cracks across their surfaces, research now suggests. The many impact craters that have pocked our moon and Earth reveal our solar system can be like a shooting gallery, with asteroids and comets regularly striking planets and their companions. These monumental blows can literally set moons rocking, said researcher Francis Nimmo, a planetary scientist at the University of California at Santa Cruz. To understand how this might happen with moons, first imagine a bowling ball as it rolls down an alley. It will often come to rest with its finger holes—where it has the least mass—resting on top, stabilizing itself. In much the same way, "if you carve a hole in a spinning planet, the planet will tilt over so that the hole ends up at the nearest pole," Nimmo told SPACE.com. "In the case of a planet, the hole is carved out by an asteroid or comet impact." Often icy moons in the outer solar system boast large impact craters. 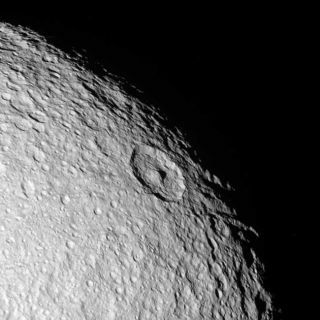 Now researchers calculate the greatest of these craters might have tilted two of Saturn's moons, Tethys and Rhea, and Uranus's moon Titania roughly 4 degrees, 7 degrees and 12 degrees, respectively. While these angles might not seem much, such tumbling would have dramatically increased stresses inside these moons, leading very likely to "a global pattern of tectonic fractures," Nimmo explained. The scientists also theoretically investigated how Pluto and its moon Charon might roll, assuming they had large craters as Tethys, Rhea and Titania do. They spin more slowly than Saturn's moons, and thus are more likely to shift. "Think of a spinning top. When it spins fast, its axis stays steady, stable. As it slows down, its axis starts to wobble—unstable," Nimmo said. If Pluto and Charon possess impact craters as large as those seen on Saturn's moons, they might have shifted 10 and 20 degrees, respectively, and perhaps "developed a global network of fractures," Nimmo added. This is a prediction that can be tested once the NASA's New Horizons spacecraft arrives in 2015, the first probe specifically designed to fly by Pluto and its moons. Nimmo and his colleague Isamu Matsuyama at the Carnegie Institution of Washington detailed their findings in a recent issue of the journal Geophysical Research Letters. Crater-triggered rolling might have happened to the Moon as well. "The Moon probably underwent multiple reorientation episodes when it was being battered by impacts early in its history," Nimmo said. However, the new findings concerning the icy satellites may have failed to adequately consider the matter blown out by these impacts, said planetary scientist Jay Melosh at the University of Arizona at Tucson. After that debris settles back down around the rim of the crater, it could even out any instabilities, reducing any resulting tumbling by as much as a factor of five. "There could still be some reorientation, and we should still look out for fractures, but this rim effect would be very important," Melosh said. On the other hand, a huge crater near the south pole of Earth's moon—the Aitken basin—may be large enough to have triggered a dramatic roll early in the moon's history, Melosh noted. "That one's big enough to count," he said.